Over on my Tennant Coat Blog I showed off the 1903 Singer 27K sewing machine I use for all my work. Though it was not this actual machine, it was a hand-crank Singer 27K that I first learnt how to sew when I was around ten years old. I was always interested how something that could essential only stitch in a straight line could produce such wonderful three-dimensional and tactile objects, such as the rag dolls my Mother would make for me and other family members in the late 60s and early 70s. I still have a clown made for me as a Christmas present when I was about five years old in 1971, and a girl in petticoats my Mother made for herself (see right). you can download a PDF of the original manual HERE. For years I was resigned to the fact that a straight line it did, and a straight line it would always do. When I bought my 27K for around £30 off eBay, it had not been used for a number of years, having remained safely in it case hidden away under the stairs of the previous owner. It just needed a little bit of oil here and there, and it was working as perfectly as the day it had been made. You can’t say that about many things built even over the past 30, maybe 50 years: that after a century it still works! What DVD player is still going to be working in 100 years time? With the wonders of eBay I discovered an array of attachments that I never knew existed. The best example of this is what is known as a Singer Puzzle Box (see above right). It is a wooden box with opens out completely flat (see above), inside which are secured a number of hemming, ruffle and spacing attachments. You can download a PDF of a detailed list of the contents HERE. Alas, I could only get a few of them to work, and the ones I could, I have little use for. I acquired them more a curios than anything else. It really is the cleverest of tools and can produce buttonholes to a range of sizes and proportions. It had never occurred to me that my straight-stitching machine could possible do anything as complex as a buttonhole, given the side-to-side movement that would be needed. As well as doing standard buttonholes, the attachment can have other useful applications. I recently used it to do some reinforcing stitching around the pockets and fly of my Six Trousers, by effectively collapsing a buttonhole down to a single line of tightly placed zig-zags (see right). One of the next hurdles to overcome in making my trousers was setting the zip fly. This is made more difficult because it is essential to sew as close to the zip teeth as possible. The standard pressure foot (which keeps the work moving under the needle while you sew) has the tendancy to not work well with one side of it sitting on the zip and the other unsupported. As a result it tends to fall of the zip and veer off in the wrong direction. I knew there would be a special foot for this, and sure enough there is. I tracked one down to a specialist sewing machine repair shop called Chapman Sewing Machine Company, at 80 Parkway near Camden Town. I described the machine I had and what I needed. Sure enough to my amazement, still make zipper feet which fit my machine and they had a dozen or so in stock. The zipper foot simply has only a pressure foot on one side of the needle. Above you can see my standard pressure foot (left) and the zipper foot (right). Notice how the standard foot is riding on the teeth of the zip. 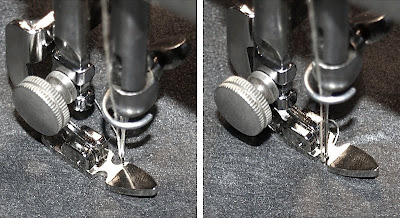 The foot is further designed to be adjusted, so that it sits on either side of the needle, making it useable if the zip is running on the left or right hand side (see below). You will see this in use when I make the Five Trousers, and later when I get to do the Tennant Trousers. While at Chapman’s I thought nothing ventured nothing gained, and wondered if there was such thing as a Zig-Zag attachment. The movement of my buttonholer was twofold: an elongated circular motion (to form the buttonhole shape); and a side-to-side movement (to create the band of overlock stitch that reinforces the edges of the hole). I wondered if there was a tool that just did the side-to-side movement, and sure enough there is. The shop assistant had to ask the advice of the septuagenarian owner, who rummaged around and pulled out a box similar to my buttonholer, but slightly smaller. Inside was what looked like a baby buttonholer with considerably fewer adjustment sliders (see right). The one slider it does have (below) adjusts the width of the zig-zag. My hope was to use it to do an overlocking stitch along the seam allowance inside the legs of the trousers to stop them fraying (you will see this in most commercially available trousers). However, although I have got the attachment working, it is proving a little erratic and hard to control. I can barely get it to sew along a pre-determined line, let alone along the edge of frayed fabric. I think I need I little more practice . . . . Rumor has it that the zigzagger has always been a little flaky. I haven't tried mine yet. Some people just keep using the buttonholer on one side and readjusting and restarting to make a longer stretch of stitching.